2.For more details about the compound, click on the product name of your interest. 3.The higher the number of " * " is, the more potent the inhibitor or activator is. 4."" refers to compounds which do inhibitory effects on the related isoform, but without specific value. PF-2341066 (Crizotinib) is an inhibitor of the c-Met kinase and the NPM-ALK. PF-2341066 inhibited cell proliferation in ALK-positive ALCL cells (IC50s=30 nM). LY2801653 dihydrochloride is a potent, orally bioavailable, small-molecule inhibitor of c-MET kinase(Ki= 2 nM). PF-04217903 methanesulfonate is a selective ATP-competitive c-Met inhibitor with IC50 of 4.8 nM, susceptible to oncogenic mutations (no activity to Y1230C mutant). BMS-817378 is a novel prodrug of the dual Met/VEGFR-2 inhibitor BMS-794833. Altiratinib is a novel c-MET/TIE-2/VEGFR inhibitor; effectively reduce tumor burden in vivo and block c-MET pTyr(1349)-mediated signaling, cell growth and migration as compared with a HGF antagonist in vitro. NPS-1034 is a dual Met/Axl inhibitor with IC50 of 48 nM and 10.3 nM, respectively. LY2801653 is a potent, orally bioavailable, small-molecule inhibitor of c-MET kinase(Ki= 2 nM). 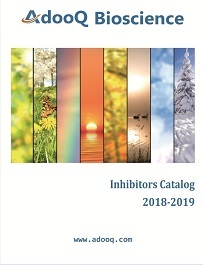 c-Met inhibitor 2 is a potent compound that has activity against cancers dependent upon Met activation and also has activity against cancers as a VEGFR inhibitor. Glesatinib hydrochloride is an inhibitor of the MET and Axl receptor tyrosine kinase pathways, which drive tumour growth when altered. MK-8033 is a novel and specific dual ATP competitive c-Met/Ron inhibitor (IC50=1 nM Wt c-Met) under investigation as a treatment for cancer. EMD-1214063 is an inhibitor of MET tyrosine kinase with potential antineoplastic activity. It binds to MET tyrosine kinase and disrupts MET signal transduction pathways, which may induce apoptosis in tumor cells overexpressing this kinase. MK-2461, a novel multitargeted kinase inhibitor, preferentially inhibits the activated c-Met receptor. E7050 (also known as golvatinib is an orally bioavailable dual kinase inhibitor of c-Met (hepatocyte growth factor receptor) and VEGFR-2 (vascular endothelial growth factor receptor-2) tyrosine kinases with potential antineoplastic activity. Volitinib is an orally bioavailable inhibitor of the c-Met receptor tyrosine kinase with potential antineoplastic activity. c-Met inhibitor 1 is an inhibitor of the c-Met receptor signaling pathway useful for the treatment of cancer including gastric, glioblastoma, and pancreatic cancer. INCB28060, a novel inhibitor of c-MET kinase. INCB28060 exhibits picomolar enzymatic potency and is highly specific for c-MET with more than 10,000-fold selectivity over a large panel of human kinases. This inhibitor potently blocks c-MET phosphorylation and activation of its key downstream effectors in c-MET-dependent tumor cell lines. Wei Deying,etc. CAF-derived HGF promotes cell proliferation and drug resistance by up-regulating the c-Met/PI3K/Akt and GRP78 signalling in ovarian cancer cells. Biosci Rep. 2017 Apr 30; 37(2): BSR20160470. NVP-BVU972 is a selective MET inhibitor. XL184 free base (Cabozantinib) is a small molecule designed to inhibit multiple receptor tyrosine kinases, specifically MET and VEGFR2. Foretinib (GSK1363089), a multikinase inhibitor of c-Met and VEGFR-2, blocks proliferation, induces Anoikis, and impairs ovarian cancer metastasis. SU11274 is a Met tyrosine kinase inhibitor. PHA665752 is a small-molecule inhibitor of c-Met/HGF/SF signaling. SGX-523 is an orally bioavailable small molecule, specifically binds to c-Met protein, or HGFR, preventing binding of HGF and disrupting the MET signaling pathway. c-Met inhibitor JNJ-38877605 selectively binds to c-Met, thereby inhibiting c-Met phosphorylation and disrupting c-Met signal transduction pathways. BMS-777607 is a MET tyrosine kinase inhibitor that binds to c-Met protein, or HGFR, preventing binding of HGF and disrupting the MET signaling pathway. MGCD265 is a multitargeted tyrosine kinase inhibitor that binds to and inhibits the phosphorylation of several RTKs, including the c-Met receptor (HGFR); the Tek/Tie-2 receptor; VEGFR types 1, 2, and 3; and MST1R. PF-04217903 is a novel c-Met/hepatocyte growth factor receptor tyrosine kinase inhibitors. AMG 208 is a novel c-Met inhibitor that inhibits the ligand-dependent and ligand-independent activation of c-Met, inhibiting its tyrosine kinase activity. BMS-794833 is a potent ATP competitive inhibitor to Met and VEGFR-2 with IC50 of 1.7 and 15 nmol. AMG-458 is a potent inhibitor of c-Met with an IC50 value of 60nM and displays selectivity against VEGFR2. BMS-754807 is an efficacious, orally active growth factor 1 receptor/insulin receptor family-targeted kinase inhibitor that may act in combination with a wide array of established anticancer agents. AMG 337 is an oral, small molecule, ATP-competitive, highly selective inhibitor of the MET receptor.